Journeys in Space Chapter 1 Change of path and disaster. Chapter 4 adventures on the Lazy Susan. The Misfits Chapter 3 Evil rises. Chapter Two – A Mine full of Trouble. 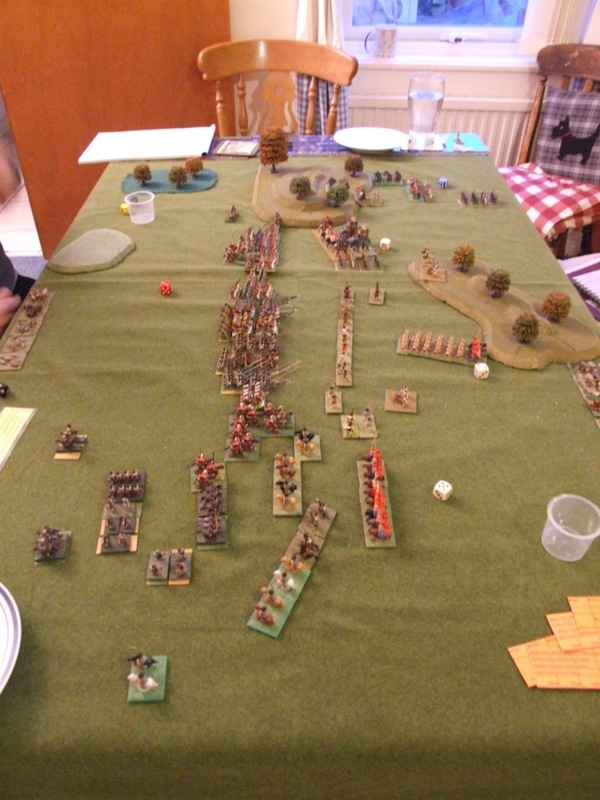 A battle report from a DBA Big Battle between my Theban’s and Stuart’s Macedonian’s. My Theban’s [left side of pic] had a Thessalonian ally on the right with my CiC on the left with 3 of the four deep spears, while the Theban sub general also a deep spear unit commanded the center from his position up with the other deep spears. The Macedonian’s keep all there horse as a reserve with Thracian’s in the far wood and Hypisats on his right with some light infantry. His center was deep pike with generals. 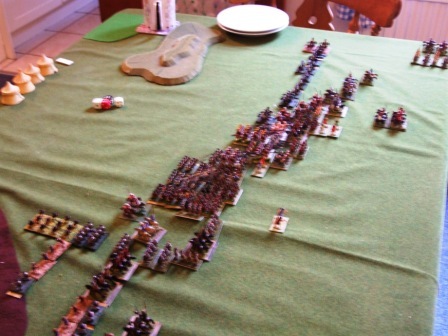 I had decided to push my deep spears quickly into contact while threatening both flanks with my cavalry although the terrain made that hard and his reserve would counter any move. After the first couple of moves the lines looked like this. My Thessalonian’s had pushed their light foot into the wood and been routed, but had slowed down that part of the Macedonian army. The next few turns brought advantages to both sides. My deep spear CiC was pushing its way through the pikes, however both Macedonian generals where breaking through my lines. The end is in sight, my Theban’s are about to break as the Macedonian generals and support infantry punch through and start taking out my flanking units. The battle ends with my army broken as the left flank breaks leaving the CiC isolated and the Sub General separated from the rest of his command by the Macedonian general and pikes which are breaking through the spear units. The unbroken Thessalonians, pull back and ride away leaving the Theban’s to die. Hannibal had assembled the above army to face off King Philip who was invading Spain with his son Alexander. The Macedonian’s had a pretty standard force of we think. Hannibal ended up facing East, with the Mediterranean on my right [placed by the enemy], Hannibal had found a hilly wooded area near to the coast that the Macedonians where marching along to face them. 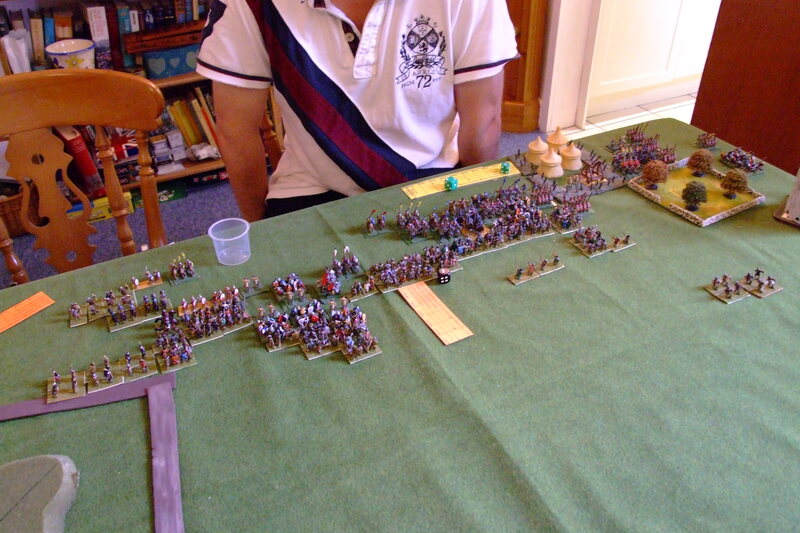 Hannibal deployed with his Numidian’s on his left with the general and his guard behind. Then came his heavy foot [Exaggerating Army Size ] flanked by bolt throwers with more skirmishers behind. On the far right by the wooded hill and the sea was his Iberian allies. Hannibal was in reserve, and deployed to the right to advance between the woods with his Spanish and elephants. His plan was to draw the enemy foot towards his foot, to allow the artillery to break them up and the skirmishers to slow them down, so tying the enemy centre up. Then the Numidians would work the open flank while Hannibal and the Spanish dealt with the other end, using the elephants to batter through if needed. 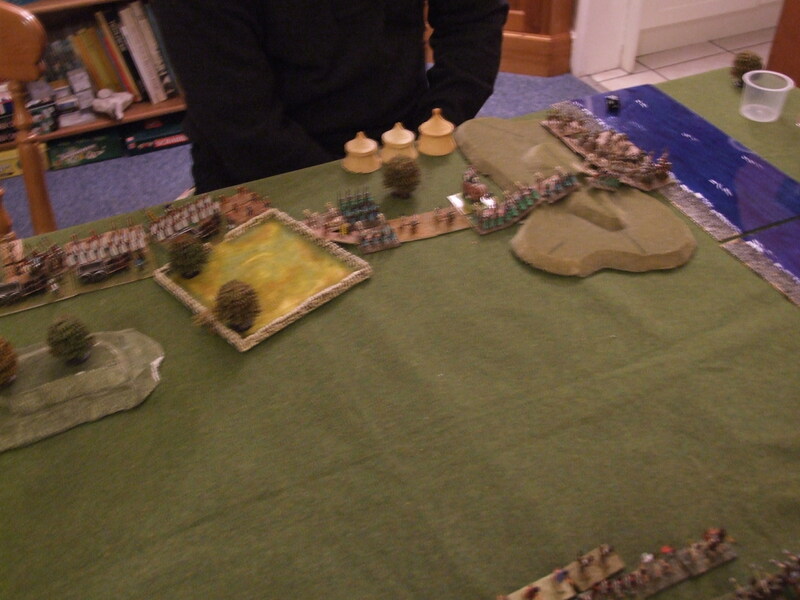 Philip deployed with his massive pike block facing my Heavy foot, with a Greek hoplite force protecting his left my the woods and sea. Alexander was in reserve on the right, waiting. Hannibal moved off first at 8am on a morning when snow was likely as Philip was marching in winter. However the Iberians where not really ready for a winter campaign and decided to sit still for now. The rest of his force moved only slowly due to command issues. 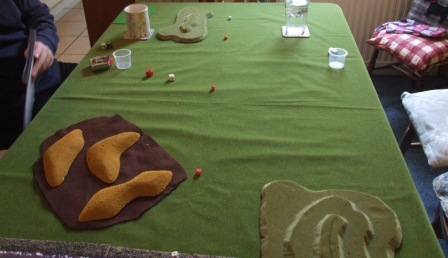 However they still managed to expand the Numidians out and the skirmishers in the centre went forward. Philip raced forward with his pikes, uncovering that their was only one rank of Libyan Spear not two. 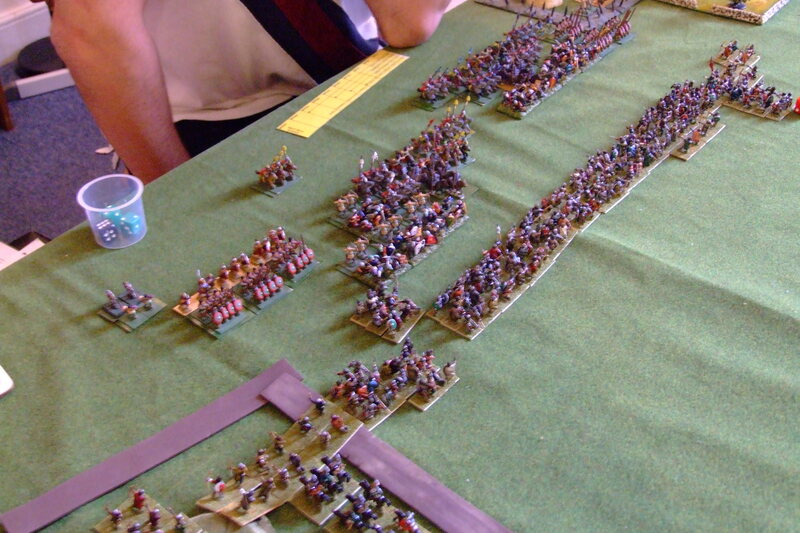 Alexander moved to threaten the Numidians and cover the flank, while the Greeks slowly moved to cover the pikes left. The next two turns was more slow manoeuvre, with the Libyan Spear moving away from the Pikes, who where suffering from artillery fire. Hannibal had tried to encourage the Iberians but they where happy where they where, talk of Macedonian gold was going around the camp. Also it started to snow, limiting visibility as it got heaver. Turn four with the snow coming down hard, the Carthaginian Javelin skirmishers on the left got stuck into the end of the pikes while a light horse hit it in flank. The end was exposed due to bolt fire and the unit started to fall apart. 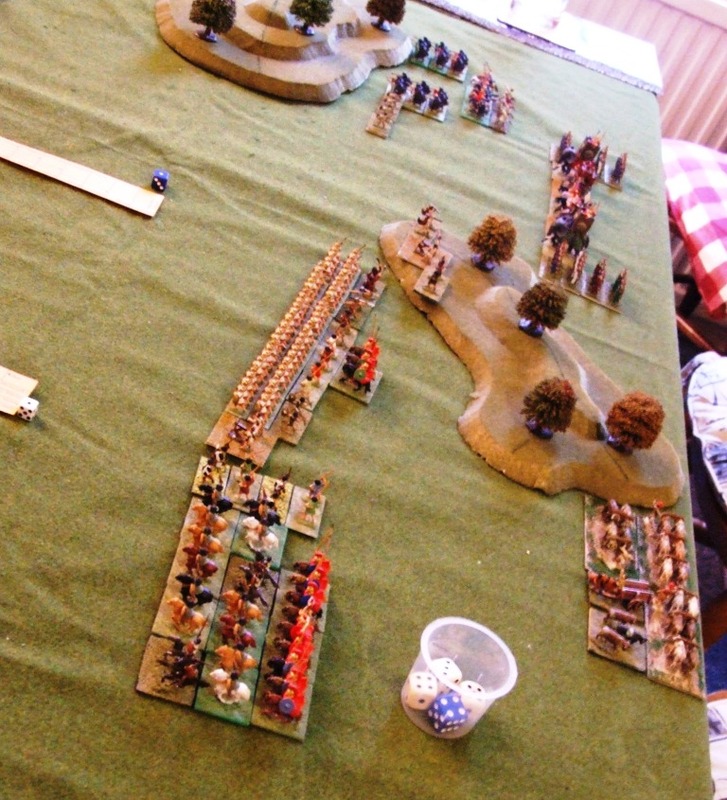 In response Alexander charged into the light horse and skirmishers killing both, but moving further forward from his supports. The battle started to go Hannibal’s way now. 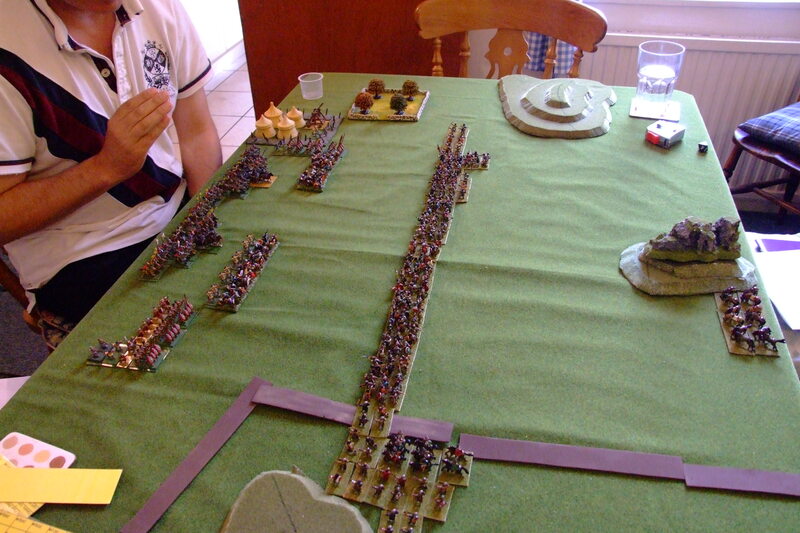 First the centres clashed, with the pike including Philip being driven back by showers of javelins, with many deaths. Alexander carried on moving forward taking out more light infantry and the bolt thrower, the rest of his force trailing behind. The Numidian light horse faced off the Greek horse and light foot on the far left and behind Alexander. On the left Hannibal had moved his elephants with Spanish support close enough with the forward movement of the Greeks to lunch a charge. The Spanish left column hit the right most hoplite, destroying it with missile fire, while Hannibal with a brilliant stroke pushed back the hoplites in front of him allowing his flanking elephants to destroy more poor Greeks. 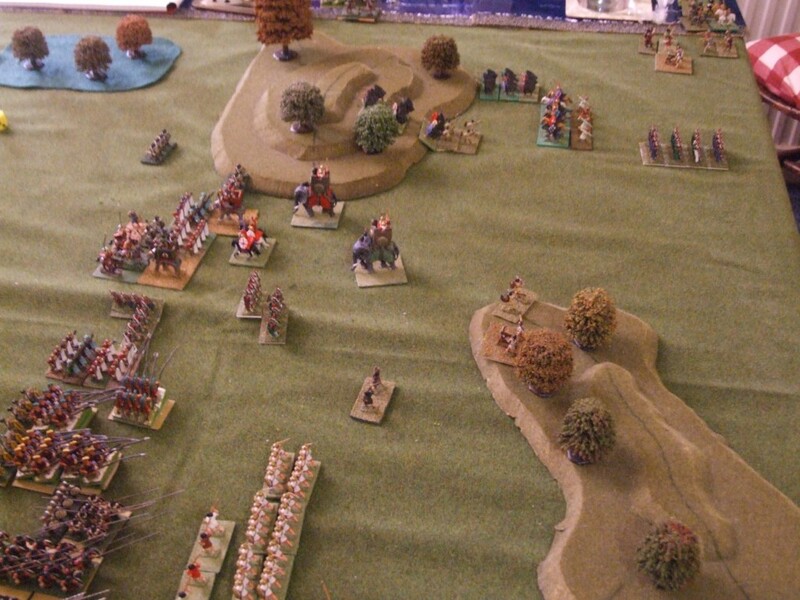 Over the next two turns, the Greeks went from dishearten to running away, while the pikes lost a 6th of their strength. At battle end it looked like this. As can be seen, Alexander and his men are in 2 columns both with exposed flanks. 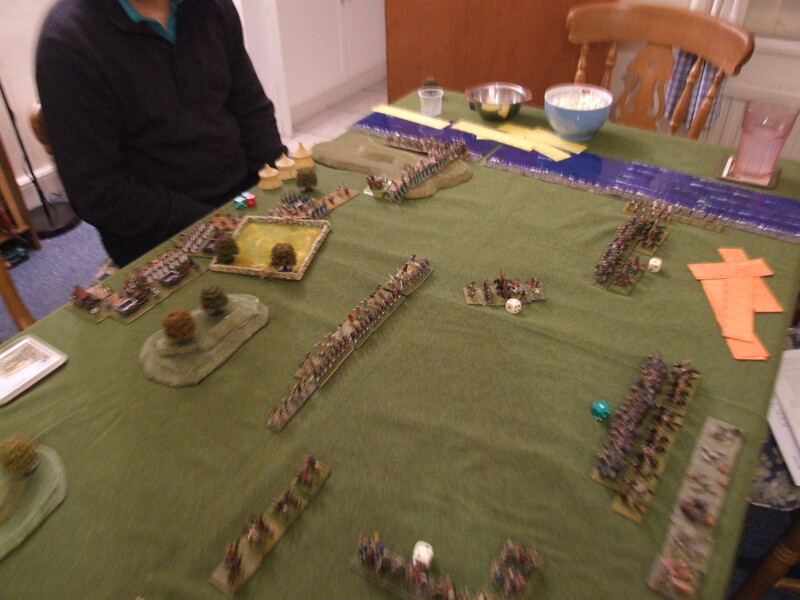 Hastrbal’s force had lost 3 light horse and 3 Light Infantry so 4.5Me out of 18. Hannibal lost one Spanish unit, while the Iberians had not taken part. 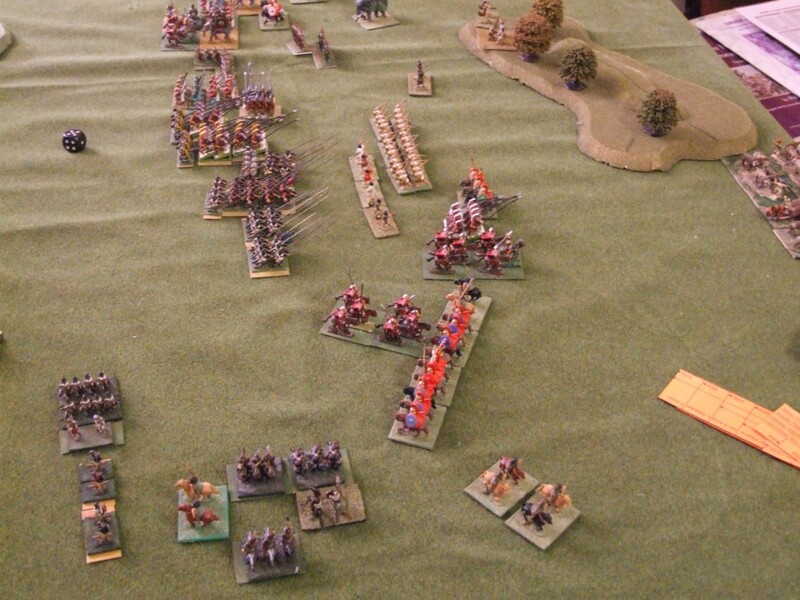 The Macedonians had lost their whole left flank as well as numerous pike from both flanks. With Alexander’s knights about to suffer badly. For a change I got elephants to work for me, as Hannibal again used the disappearing center tactic. The Seleucid army invaded Ptolemaic territory from the East in the summer; Ptolemy made his stand with the Nile on his left. There where Sand dunes on its bank and a gentle hill jutting into the river and a patch of rocky ground and another gentle hill on the far end. His next move brought him into sight of my pickets but not into contact. I moved my right pike into the Galatians and the picket into the knights, hoping to disrupt his force. That didn’t work and little else could move with my generals being in reserve and therefore not in sight. The next hour went fast, with combat along the whole front, with dawn and then sunrise opening up my generals control but this was of no help to the enemy as there generals where in the front line. On my left his lights attacked mine but where then ridden down by my knights, while his general was pushed back and his companion routed. This enemy command was close to disheartening but the battle was not going well in other areas. On my right my Thureophoroi and light horse charged in and got recoiled and then the Thureophoroi got chewed up my the knights. The centre was the main point of combat as the two blocks closed with each other. Long story short, my men caught in camp were not ready to fight and that showed in there efforts [loads of 1’s and 2’s]. by 5.40 my centre was disheartened and would break on the enemies next push and then take the army due to other losses. A decisive loss as I was caught unawares by the enemy. This was one of those times I wish I had scouting, funny how when you take it you don’t use it and when you don’t. We both love playing this game and the variety it brings to games. with 3 numbers on the Chinese base line that is where most of the terran fell, all but 1 Gentle hillw ich could not fit anywhere. I deployed first in multible lines. The Chinese then deployed 2 commands between the sea and warwaggons, orchards and hills. This meant there was a flank march and the troops on board were in a fortress. I moved first and the Chinese sat and waited. 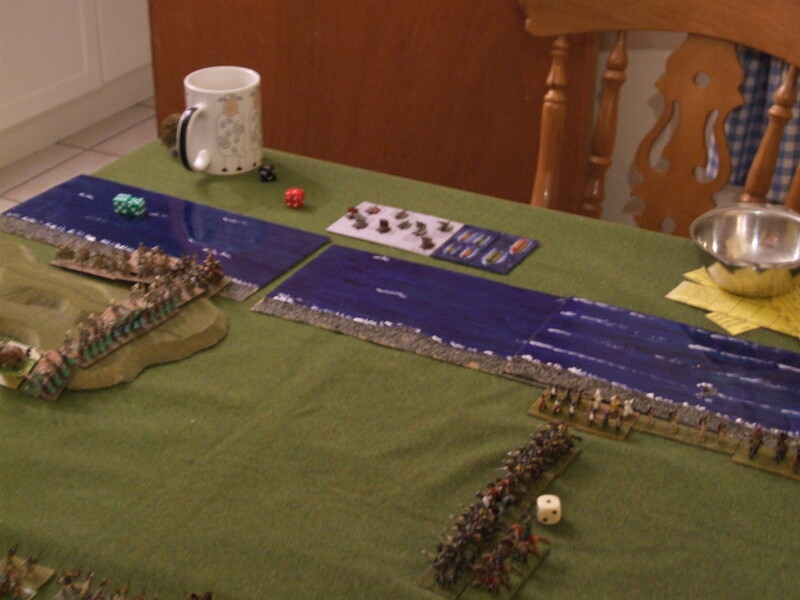 This was the scene after 4 turns after the naval flank march turned up. I had covered the waters edge and my open flank with troops, but moved those covering the open left flank once I knew it was a naval attack. The Chinese decided a while after this to call it a day they dared not land there strike troops or move out of the fortress to support them. Although I could not defeat them tacticly they were in a mess as my light horse would stop them retiring and the wind from the NW [upper right corner] meant that the ships had limited movement options. 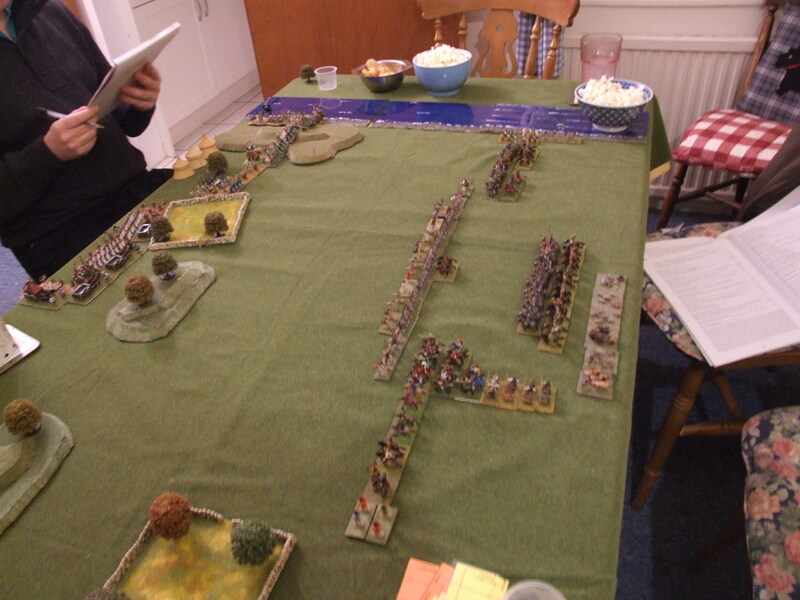 A interesting game even if we never got to fight as it showed what could happen historically when a manily foot army found inself up against a mainly mounted and light army. I felt that he had brought to many gimmicks to be able to use any effectly. Also not putting his side number on the sea flank but his base line meant he was boxed in. The empire went for 1FE & 1/2 FE DH 2 1/2 CH and a road. Battle was due to start at 4am but as I had invaded in Spring into warm I could only start an hour before Dawn which was 4.30 with no moon. 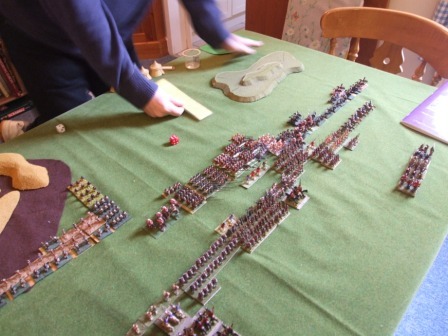 I had lost a scout during scouting but did know all his army was encamped with no surprises. So I went with a night attack, anything to stop lots of regular units moving around my flanks. I got 3 moves in the dark, which due to variable die meant I did not get into sight of the enemy. This was my position at 5.30 when it became the Byzant turn as dawn started to break the pitch darkness. Now we had 400 pace visibility and they could respond. His Russ column has come back into a line 6 deep in the middle. His Art is potting at my Lights on my right and recoiling or fleeing them., this is all that happens all game there. My sub on the right has been recoiled by archery and some spear on my left have surged forward from shooting. Contact with the rebels. My CiC with Lights and mounted is starting to threaten the enemy flank. Contact along the whole front. Byzant wedges have been hit rather than hitting me. 1st Knight wedge goes down to blades. My Delayed command has arrived. I am about to hit the enemy left with my CiC. That along with gaps appearing along the line under the pressure of so many spear and blades, meant the game was going my way. 6.50 start of Byzant turn. With his right fank command broken the loss takes the Russ ally out as well and that plus the lost units on his left took the army. The report of a battle between the Kushan’s and the Romans under Caesar. For a change we thought we would try 400points on our 5×3 table rather than the normal 350 we play. If this worked it would allow a bit more flexibility in army make up and choice. We had decided on book 2 dates and this is what happened. Caesar decided to head out to deal with the threat of the Kushan’s in the winter to catch them off guard. He was the attacker. Deployment after 2 sets of die rolls, all tied, was 18 hours after midnight on a moonless night after the first hour. The rules do not seem to allow winter night attacks so we started at 6.30 next morning. This was a shame as Caesar expected a night attack to prove to his advantage. 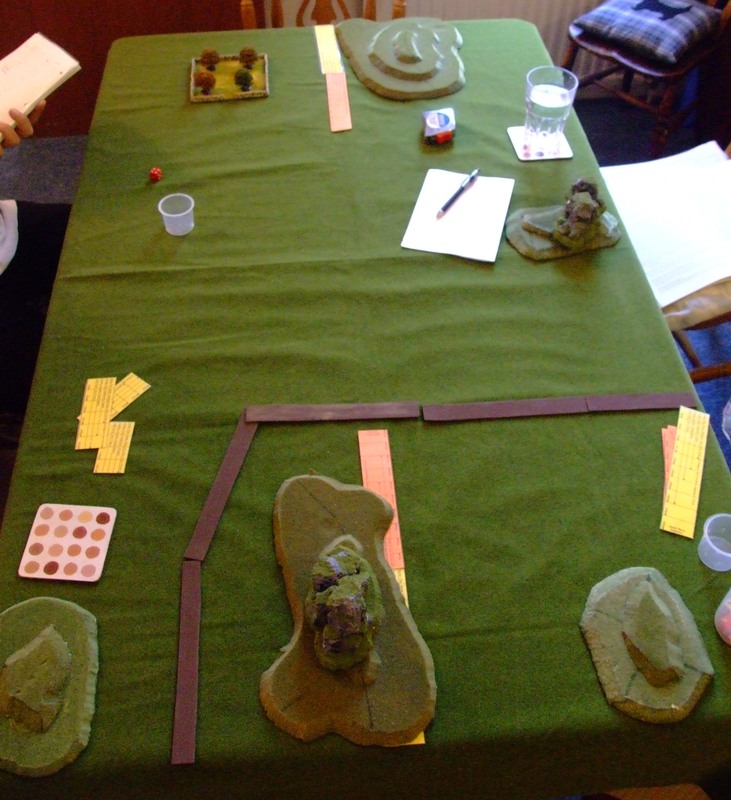 I chose 2 1 size SF but could not fit one, the Kushan’s went for a field; gentile hills and a road. As can be seen only the hills and my scrub ended up on board. The Kushans deployed with a centre of elephants and infantry with flanks of horse archers and armoured nobles each side. With on his left flank the Hunish allies ready to move over the hill and envelope my flank. The Romans deployed with Cato in the centre formed in a Triple line with Art in the centre. Labinus was on my left with the Germans out front and then the legion in a triple line behind. Caesar was in reserve but offset towards the more open flank where the camp was. 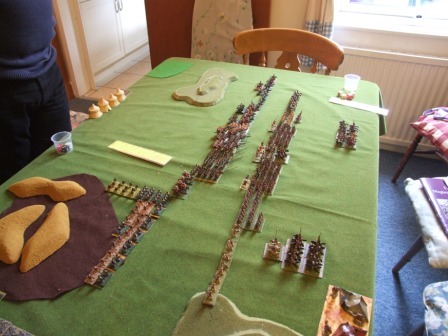 My initial plan with the army was to use Cato to pin the enemy while Caesar marched round one flank with Labinus holding the other. This was not going to work in this case as the Kusans were going to move first and so I would not get to pin the faster moving troops. 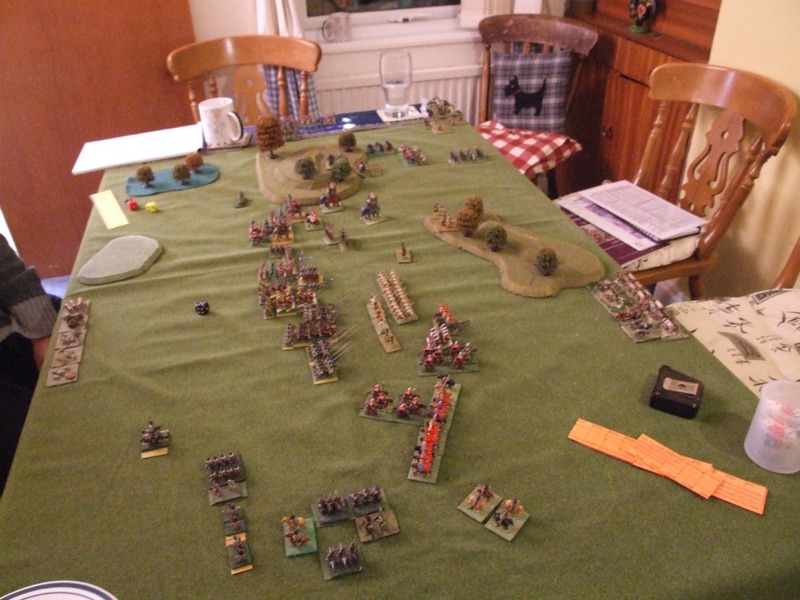 As can be seen by this picture the Kusans rapidly moved forward with their light horse across my front, while his light infantry moved to cover his centre, he had become aware that his CiC was in danger from my battery of bolt throwers. 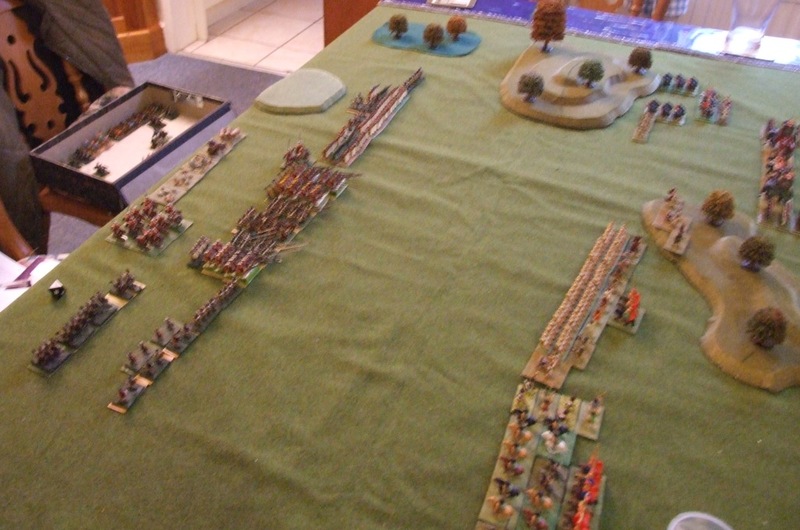 Caesar moved his command to protect the right flank from the Huns. By now the Kushan CiC had retired and some of his light infantry had fled from the bolts, as had a horse archer. Caesar had organised a good flank cover based on the camp and felt quite secure. He had also moved the German horse with light Legionary support to cover the centre. While Labinus moved after the retiring horse archers in front of him. With part of Cato’s command covering him. This was looking like it would become a scrap on my right. The Huns have a surprise for Caesar, they have a traitor in his camp. That was comes of allowing locals in. They open a gate and allow an impetuous unit in. the rest of the Huns hit the X Legion in an impetuous charge.. They throws the unit by the camp back but the rest hold. The bolt throwers flee more light horse, while the Kushan centre advances to protect the flanks of his flanks. Labinus now has his German light infantry ready to charge into the Horse archers in front of them. The unit in my camp destroys a baggage and advances again. Caesar moves more of his elite legion in to cover the Huns. Labinus Germans get recoiled back through the supporting legionaries, expect one who had support from some of Cato’s troops. More horse archers flee from bolts. The camp managed to eject the Huns before losing any more, however there are fires and one baggage was destroyed and one spent. Caesar’s men continue to engage the Huns pushing them back, but now the Kushan’s have also joined in. In the centre the Main line of Foot and elephants have moved into range of the bolt throwers and a unit of elephants enraged by the bolts flee from the field out of control. Close up of my right. We have played for over 3 hours nearly 4 with set up and its time to stop. The battle is not decided and it will take many more hours before it would be. Kushan – 1 El lost 5 Lh Spent. Plus 5me bribe. 400 points on a 5×3 table will work. We need to get more used to the rules and have quicker moves. My plan of a big centre with 2 good quality flanks was fine and the bolt throwers were a good investment. I thought that the Kushan’s would have been better off flanking the Huns and he thought that he should have had his CiC delayed which would have allowed him to be where he could be of use. As usual a good game. I never got to use my brilliant as my move die were always enough and never got to combat. Maybe next time.